I recently got back from my month long vacation in Odisha. I barely had any network connectivity while I was vacationing, so there was a lot that I missed. But one thing that I had put a reminder about was the India Couture Week (ICW) 2016. I just missed it by a couple of days, but I knew the show would be epic. Considering this is a wedding blog, and I am so tuned into all things wedding…I just couldn’t miss this. So the first thing I did after coming home, was spend hours on Instagram looking through gorgeous outfits by ace designers. The Persian Story by Manish Malhotra was the first thing that caught my eye. 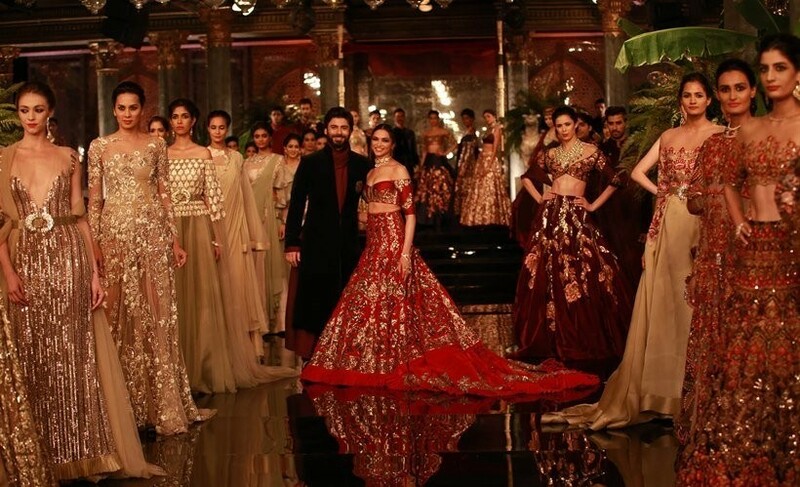 Think opulence, grandeur, bride and groom picks and more…this collection was every inch couture and how. Feast your eyes ladies, this one is going to be one gorgeous post ! The collection was inspired by the architecture of the fabled land of Persia. In the designers own words, “I have always been drawn to Iranian culture and music so I decided to add a touch of the lost world to this season’s collection“. The collection saw a wide range of heavily embellished lehengas, off shoulder gowns, long jackets, anarkalis, sherwanis and sequinned dresses which featured elaborate architectural, floral motifs and check shirts and achkans. Personally I felt his entire collection highlighted his attention to the details. Normally one would feel that velvet as a fabric is really heavy and pulls you down, but the designer used the vintage techniques of couching on the heavily embroidered velvet brilliantly. If the conventional blood red is not your preferred bridal choice, then Manish Malhotra inspired maroon velvet should definitely be your bridal pick. The color is here to stay this season. The only reason why I decided to write about Manish Malhotra’s Persian Story collection was this – his menswear collection. You don’t usually see such a vast range of stunning pieces in one collection. Every piece is a grooms worthy wedding pick. I just can’t decide whether I love the full work sherwani more or the plain solid bold color ones. Which one is your favorite? Oh my gosh, can you see how radiant Deepika looks in this red hot outfit ! I can’t take my eyes off of her. Just loved the outfit. Its the perfect finale outfit. If you want to make a grand reception entry, Deepikas outfit is the one to go for. I was not much of a fan of Fawads outfit, but he is just so cute…I think he just manages to look good in anything he wears. There is something magical about simple yet glamorous. Its hard to achieve but this outfit does it justice. I think its such a gorgeous color, with just the right amount of bling. So cinderella like in a dark way. I so badly want this outfit. My personal favorite from the collection. Can you see the detailing on this one…stunning isn’t it?